Now, which are the malfunctions of the present monetary system? 1. Money is created as debt.Today, money comes into existence by debt creation when commercial banks borrow from central banks and when governments, producers or consumers borrow from commercial banks. Thus, the money supply of the economy can only be maintained if the private or public economic actors get into debt. Economic growth requires a proportionate increase in the money supply in order to avoid deflation that would paralyze business, but an increase in the quantity of money involves a simultaneous increase in debt. This way, economic actors run into danger of excessive indebtedness and bankruptcy. It is not necessary to say that overindebtedness causes serious problems to societies and individuals in the face of the ongoing debt crisis. As I find myself in disagreement with almost all sentences, let me tackle them one by one. (I am doing this because I think that the analysis is flawed, not because I don’t like the conclusions.) The first sentence of the answer is correct, but imprecise. What is meant by money? Money-reserves created by the central bank? Money-deposits created by banks? Money-deposit certificates created by money market funds? 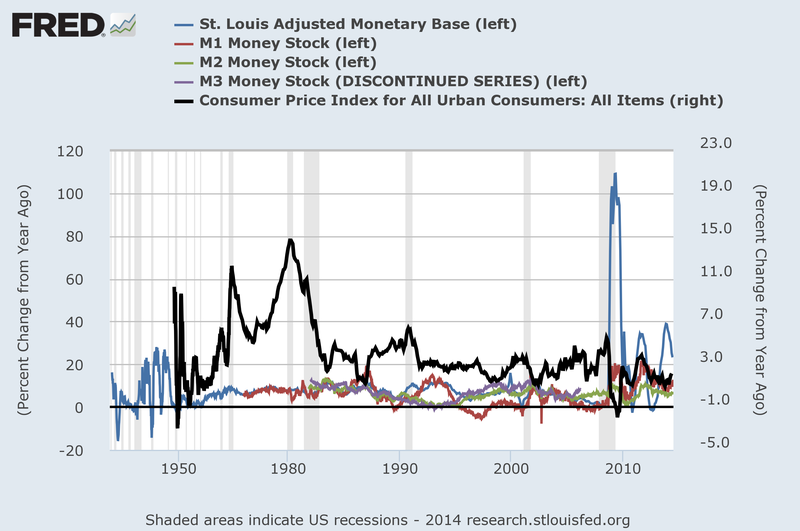 As we start here with “money” being highlighted – although not defined – and loan demand and interest rates neglected we’re roughly in the Monetarist camp. Thus, the money supply of the economy can only be maintained if the private or public economic actors get into debt. Economic growth requires a proportionate increase in the money supply in order to avoid deflation that would paralyze business, but an increase in the quantity of money involves a simultaneous increase in debt. Now for the second part of that sentence (“an increase in the quantity of money involves a simultaneous increase in debt”) I can not see how that can be true. Money is debt, sure, but not all debt is money. Government can create huge debts, which would allow the private sector to use the additional deposits (from incomes paid by the public sector) to pay down its own debt. This would shrink the private sector debt and therefore money and increase the amounts of government bonds, which are not counted as “money”. So, an increase in (public) debt can decrease the quantity of money. Probably this is part of the Japanese story of the last 20+ years. “This way, economic actors run into danger of excessive indebtedness and bankruptcy.” Well, except that a government with a sovereign currency cannot go bankrupt. The case of Japan shows that government spending can prop up an economy is the private sector decides to pay down debt. Technically there is not a problem with the monetary system, quite the opposite. One just has to use it right. Also, “excessive indebtedness” is very vague. What is the yardstick? Sure, we can outlaw any loans, but then you can only start production if are very, very rich. Only the super-rich do not have to worry about “excessive indebtedness”. It is not necessary to say that overindebtedness causes serious problems to societies and individuals in the face of the ongoing debt crisis. Hmmm. This is very one-sided. After 1945, many Western societies had good growth rates. Many firms borrowed from banks to start and expand businesses, households borrowed to buy houses, etc. Now there are some countries that suffer, but they are mostly inside the euro zone (Spain, Ireland, Greece, Cyprus, etc. ), which is a special case due to the lack of exchange rate adjustment. The UK was a case of self-imposed austerity, which was not necessary under the monetary system. Iceland defaulted on its bank debt and seems to be doing more than OK. Going through the rest of the text I encounter many expressions which I think are just plain wrong: “interest has to be paid on all the money in circulation” (I pay no interest on my cash, do you? And banks can acquire cash from the central bank by selling government bonds to it), “Interest is a subsidy to the banks because the account money they create is handled as legal tender” (no, it is not), “In a sovereign money system the unnecessarily complicated two-level banking system would be replaced by a single-level system, in which money is no longer backed by reserves” (money is not “backed” by reserves today), and last but not least, “the existing bad framework that governments attempt to straighten out with evermore complex regulation consisting of the fractional reserve system, …” (we don’t have a fractional reserve system because banks cannot lend out reserves). While I believe that many Vollgeld (100% money) supporters have good intentions, I’m afraid that their analysis once and again builds on a neoclassical world view which should have been discarded decades ago. Building on flawed foundations, the new financial house will be unable to wheather the storm – like the euro, which has also been build on neoclassical foundations (crowding-out, monetarism). Nevertheless, there are still many issues that are of shared concern: the role of private banks and financial markets in the crisis, the lack of concern for the real economy (jobs) and ecology, and political economy and macroeconomic problems resulting from a very unequal income and wealth distribution. To sum it up: I am not convinced that the economic malaise in some European countries has been caused by inherent flaws in our monetary system and I am not convinced that these flaws cannot be remedied in the existing framework (through higher capital requirements, for instance). Yes, bank loans financing real estate have caused the boom (and the bust), but without those loans we would have had lots of unemployment and very likely negative growth rates. Of course, fiscal spending could have been used to fill the gap in demand, but the politicians (and economists) did not want to touch that policy except for that brief time during 2009. I cannot see how we need a new monetary system in order to clean up the mess in Europe. There is much to be done, but from the macroeconomic perspective freeing us from the fiscal constraints should be enough to return Europe to growth and prosperity shared by all Europeans. Sorry don’t understand your last point. What do you mean no change is required in the monetary system? The Euro Area needs a supranational fiscal authority but you seem to say not. Just easing fiscal constraints won’t do the needful. For suppose Greece’s net international investment position deteriorates more and more, bond holders may not like it and if the Eurosystem ends up holding more and more bonds, it becomes a political problem. That’s because if the ECB promises to hold bonds without any condition, it gives countries like Greece and open line of credit. Of course it doesn’t mean Draghi is right but you seem to believe it is all simple. I suspect MMT distortion of your thinking. Then you probably are not interested in my arguments. Doesn’t engage. Look at your last paragraph: you are saying as if it’s as easy as relaxing fiscal constraints and prosperity follows: what if Portugal runs current account deficits of 12.5% of GDP like it did in the peak of the boom? Surely not a problem according to you? I used MMT distortion because you repeat the mantra that some nations cannot go bankrupt supposedly. Here is how it can happen: the nation runs into a balance of payments crisis and needs a lender of the last resort and the IMF asks the government to default on government bonds held by the private sector. Escape from MMT! This way I can prove that Canada can run out of water: the US invades it and forbids Canadians to touch taps. Voila! It is lack of political will to bring about the fiscal policy needed, the monetary system is doing (relatively) ok (for a crisis). And yes, some countries would run current persistent account deficits (Portugal? ), just like some US states do inside the US. But why worry? Of course, we have to develop new rules on how much countries can spend, and what should be paid for by Brussels, and such things. But that’s nothing that we can’t achieve. It’s the politician’s who are scared because they believe in the neoclassical humbug (confidence fairy, bond vigilantes, expansionary austerity, Reinhart/Rogoff, etc.) and have bought into the “sovereign debt crisis” story. Now that national tensions have arisen it is hard to come back to rational debate. And about that “mantra”: a government of a country with a sovereign currency and no debts denominated in other currencies cannot go bankrupt. Look at the US: the central bank keeps on accumulating t-bonds, and thus the Treasury pays more interest to the Fed, which sends its profits to the Treasury. The Fed can create reserves infinitely with which to “finance” its acquisitions of t-bonds. Countries using foreign currency-denominated government bonds sure can go bankrupt, but now that the ECB will do “whatever it takes” nobody believes that anymore: bond yields have come down. Look at that book review I published some days ago. Even a former Deputy Secretary of the U.S. Treasury Department says that the US cannot go bankrupt. JFK said that, too: http://neweconomicperspectives.org/2013/11/jfk-federal-budgetary-policy.html. And meanwhile we’re still waiting for the bond vigilantes to punish the US government. I don’t care about “MMT distortion” or whatnot: show me the balance sheets and explain to me how the US government (or the UK, Sweden, Japan, Canada, etc.) can “run out of money”. Take Wray’s primer on modern money, for instance, and show me where he is wrong and why. I’ve been a neoclassical economist until the end of my PhD – I’ve been persuaded before to change my idea of (monetary) economics. Yes read your last part again, especially the phrase enough. Just today I came across a nice article about Indian politics titled “Artifice of Hope” and your last part sounds like one. Like the political union is so easy? Even if/when the union is formed, there’s a political question about how this institution functions and how much of expenditure it allocates to one region compared to other. Plus at the very least the institution is huge change in the monetary system. Anyway not interested in Wray nor appeal to authority. The US is different from other nations: like what the IMF cannot ask a government to default or whAt? But different discussion considering this post was on the debt free money guys. Show us how Canada can run out of CDN to default on its CDN obligations please. Ramanan, you are reading meanings into my sentences that are just not there. Where did I write “the political union is so easy”? I didn’t. My point is that from a macroeconomic perspective you need more demand, and if the private sector is paying down debt it has to come from the public sector because the rest of the world is connected via a flexible exchange rate to the euro zone. In macroeconomic terms this is very easy indeed, even the good old IS/LM model will show you: In times of depression, deflationary tendencies and high unemployment you need a fiscal stimulus. If you can’t bring it on, then your currency union will fall apart because people will vote for any alternative (although there is none, as we are all told). In political terms, it is difficult. About the common market: do people in the US discuss competitiveness, current accounts and fiscal tarnsfers of their states? Do people in India do that? A fiscal mechanism with a sovereign currency (allowing government bonds to be risk-free) is all you need to stop caring about intra-country balance of payments. That is what a currency union is: a region in which you have one currency and all debts are denominated in that currency so that you have the biggest policy space possible. The EU did not have to call the IMF – and now we have de facto risk-free eurobonds in EMU. What is needed is a fiscal mechanism, but that is another discussion. My blog post was clearly not about that big fat issue. And forgot to mention a very important point: the common market is a huge reason for the Euro Area’s problems as it is in the interest of strong nations’ corporates and at the expense of weaker nations’ firms. So to solve problems, weaker nations also need some kind of protectionism to survive from competition from Germans etc. other plans are needed to improve competitiveness with an expansionary bias instead of the ideological Draghi way. You can’t simply make it look as if prosperity is easy. First, there was no WEA article on Positive Money for the writer to respond to. Rather the link is to a Positive Money citation of the Swiss Modern Money movement being highlighted in the WEA newsletter. Interest has to be paid (perpetually) on all (debt-based) money in circulation. Are you claiming that bank credit money does not satisfy all legal claims against any debtor in either country, because that is what makes the legal tender claim……it is legal to tender(bank credit) in payment to satisfy any amount due on any account. Or, are you just saying that the “money power” (creation of purchasing power denominated in the national unit of account) is ‘not’ a subsidy to the banks? All modern monetary economies operate internally on ‘reserve’ requirements and additionally, externally, on capital requirements. This is ALL a throwback to the gold standard, when gold-holdings (and others) ‘backed’ the amount of money in circulation. Today the central bank manages the national money and banking system through its ‘two-tiered’ reserve requirements. Although banks can make loans without regard to reserve holding at the CB, they must maintain their required reserves in order to continue to use the “money power”. Don’t be blind to the change to a non-reserve based, real-money, system. “”“the existing bad framework that governments attempt to straighten out with evermore complex regulation consisting of the fractional reserve system, …” (we don’t have a fractional reserve system because banks cannot lend out reserves). Now, this is either ‘red-herring’, ‘rabbit-holing’, a linguistic trick, or just plain ignorance. It defies even orthodoxy and classical monetary economics. It is not necessary for the banks to lend out reserves in order for there to be a fractional-reserve banking system. Have a read of the Fed’s “Modern Money Mechanics”, for the clarity that BOTH are true. The banks cannot lend out reserves…….and……. we have a fractional-reserve banking system. So, basically, ALL of Dirk’s “just plain wrong’ assertions are just plain wrong. I don’t agree with the characterization of the system in “Modern Money Mechanics”. “Fractional reserve banking” is a doctrine, providing foundations for the money multiplier view and I think it’s wrong. If you mean by “fractional reserve banking” that banks keep a fraction of their balance sheets in reserves, than that’s correct, but trivial and not the usual meaning of “fractional reserve banking”.